Toddlers are top-heavy and can flip easily on a descent – so a waist-harness is not secure enough. 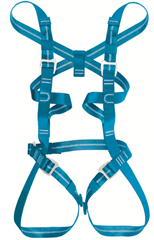 I&apos;ve been looking at full-body harness options. The first is the Petzl Ouistit – it&apos;s a nice harness with some good padding in the leg loops. However, the leg loops don&apos;t look as adjustable. It&apos;s designed for 4-9 year olds – and while I read reviews of people putting a 3-year old in it – I suspect it might be too big for Chester. So next up is the Mammut Elefantito. 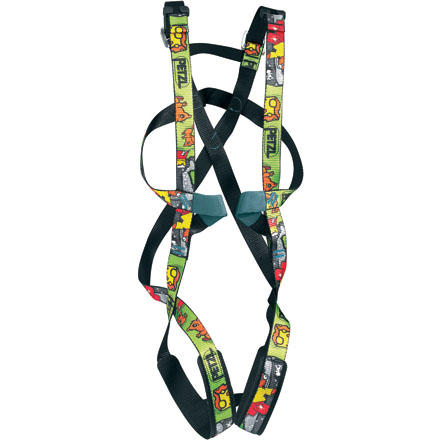 Granted, this thing may look like Joe Brown bodged it together with some left-over slings while eating a bacon buttie at the bottom of Tremadog, however, it is a lot more adjustable and several reviews report it fitting two year olds quite well. So the Mammut wins this time. Assuming Chester takes to a few trips to Vertical World, Daddy will be breaking out the drill and whipping up a quick 4×8 panel of holds in the garage for him to tinker on. This entry was posted in Climbing on October 6, 2010 by brettm.